This one was floating around Facebook and I should have grabbed the link but instead looked at it and went oh that’s kinda neat. Then I needed a food idea and thought of these but couldn’t find it any more! So I made my own up with what I could remember! I made up meatloaf like I normally would for a regular meatloaf, so you can do that whatever way you want or normally do it. Carefully I peeled the top thick layer of onion off my onions, if they were large I could get a couple layers off before they were too small to be worth making. The rest of the onions I put in baggies in the fridge to use with salads. 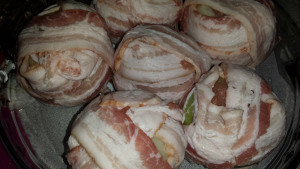 Fill up your onion shells with the meatloaf mix, and then wrap each onion with bacon, it took 2-3 strips per onion to get them covered and even then that wasn’t really enough to get them totally covered in bacon. I baked them in a pie plate at 375F for about 30-45 mins until they looked done and the bacon was crispy on top. We had mashed potatoes and some mixed veggies with them and it was amazing! Will definitely try these again!